We have been enjoying our new house by having lots of friends over and eating good food. Last night we even played a couple of rousing games of Taboo. How fun! Welcome back to our new Monday series of book reviews. You'll noticed I've started calling it "Weekly Reading." As I said last time, I don't know if it will be every single week, but I like having an official theme to use to mentally organize my blog posts-- and it would be really good for me if I read something new every week! This week, I read The Improv Handbook for Modern Quilters: A Guide to Creating, Quilting, and Living Courageously by Sherri Lynn Wood. This book is different from the majority of my Christmas gifts because I don't remember anyone in particular recommending it. i think it came up as a suggestion on Amazon, and I thought it looked good. and OH WOW was it good! The book focuses on ten methods of improvisational piecing which Sherri calls "scores." Each score focuses on a single technique, and Sherri breaks down the process of each technique to allow the quilter to take it one step, one "musical note" at a time. At the end of each score she also has mental exercises for reflecting on creative processes and products, ways to change the score to keep it fresh or to make it more challenging, and examples of quilts other quilters made from the score to demonstrate its versatility and openness to interpretation. After the scores, there's a substantial section of the book about the specific of certain techniques Sherri references within the scores as well as color theory, techniques for problem solving common quilting pitfalls, and completing the quilt. One of the things I found most interesting about this book was Sherri's emphasis on building the whole quilt bit by bit by making improvised units, playing with the on the design wall, then connecting them with more improvisational techniques. It is different from last week's book, 15 Minutes of Play by Victoria Findlay Wolfe where she uses improvisational techniques to create Made-Fabric, but then cuts the fabric into more familiar quilting units. For my own initial experience from this book, I combined Scores 7-9, "Layered Curves," "Bias Strip Petals, and "Get Your Curve On" into something of it's own tune. You an see with the middle photo above that I had a lot of trouble adding to curves with the Bias Strip Piecing on the Curve, so I ended up using a cutting technique from "Layered Curves" to add fabric around my wedge-made curves from "Get Your Curve On." I wanted to combine the scores from this book with my Made-Fabric Georgia from last week to fill in the background and complete the quilt top. When I first pieced some curves, I envisioned waves of warm color behind GA, some of which would be these pieced units. 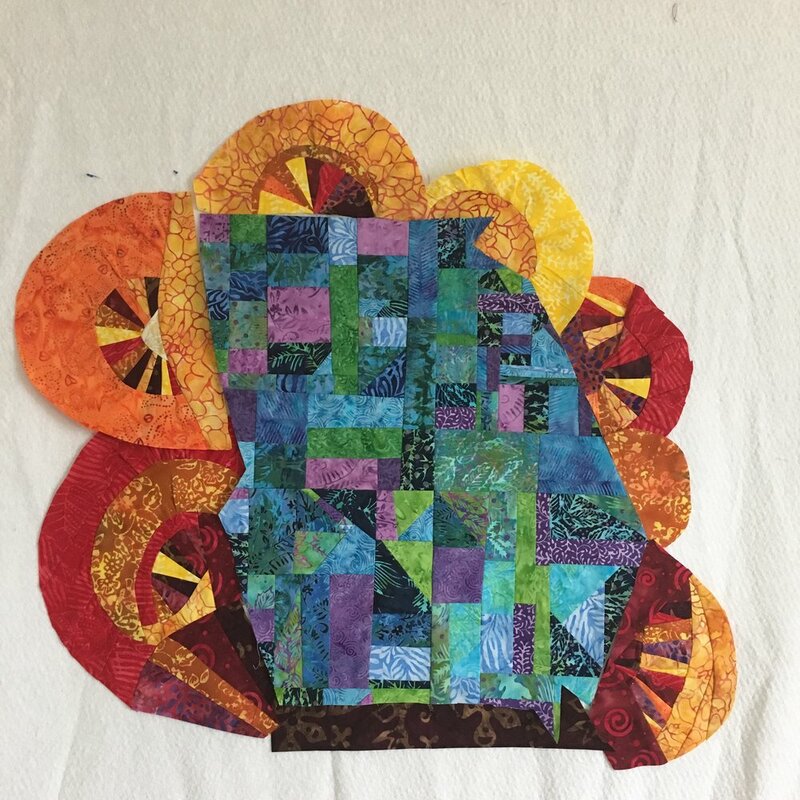 However, the combination of the pieced curves looking like worms and struggling with Bias Strip Piecing on a Curve sent me back to the drawing board. Instead, with the help of a YouTube Video, I adapted the cutting method for "Layered Curves." My curves were not (and still are not) totally flat and un-puckerked, but they became much better and are still improving. You can see how I rearranged the pieced curves and am building, bit by bit and curve by curve, a collection of elements on the design wall. When the pieces fill an area about 40 inches square, I'll figure out how to piece it all together (I suspect y-seams and the like are in my future), then trim it to 36 x 36. As I mentioned at the start, this book made me say, "WOW." I loved it. The photography is beautiful, I love the open-ended nature of the scores and techniques, and I enjoy the reflection exercises that encourage me to think past, "That's D for Done-- excellent!" That said, the subtitle is entirely accurate-- the methods of this book do require courage, perhaps even a bit of child-like abandon. In this, my youth and relative inexperience at quilting serve me well. But these scores are a mental and creative workout. They ask you to focus and think even as you play. After all, playing really is hard work! This book is no shortcut for a quilter looking to escape matching points and cutting accurately. Premeditated wonkiness and free form cutting may be the names of the game, but your creativity will be stretched and challenged in the best of ways. I highly recommend this book, especially if you are already interested in improvisational piecing. It unlocks valuable skills and encourages new, exciting challenges. And ohmygosh the photography!! Once again, Happy New Year! We were up late to ring it in Saturday and up late again last night watching Sherlock, so I think I'm going to take a little nap while John is playing with the boys downstairs. Then, laundry and quilting await!